Svalbard is a barely inhabited group of island in the Barents Sea which has belonged to the Kingdom of Norway since 1920. It is governed by a unique set of rules - the Svalbard Treaty - which grants the non-discriminatory treatment of signatory states nationals, environmental protection and non-military use. This setup worked well for many decades and for an increasing number of signatories. However, prospects of large fossil fuel reserves in the region and the development of a comprehensive international law of the seas, which seeks to clarify the governance and ownership of the world's oceans, have put a spotlight on the weaknesses of the Svalbard regime. There exist different interpretations of the scope of the Svalbard regime which may increase in the light of climate change and better accessibility of oil and gas reserves in the Arctic Ocean. So far, the conflict is not much more than a diplomatic dispute. However, this could change as oil and gas explorations intensify. Svalbard has belonged to Norway since the signature of the Svalbard Treaty (also known as the Spitsbergen Treaty). It was signed at the Versailles Peace Conference in 1920, as one piece of a puzzle of territorial treaties which aimed to end war once and for all in Europe. The vision of a peaceful world was destroyed less than 20 years later with the outbreak of the Second World War. The Svalbard Treaty is one of the few agreements of Versailles that survived these destructive years, as well as the Cold War period. It enshrined the principle of “equal treatment” for the signatory countries and made a peaceful coexistence of East and West in the high north possible. The original signatories of the Svalbard Treaty were Norway, The United States of America, the United Kingdom, Denmark, France, Italy, Japan, the Netherlands, and Sweden. (Numminen 2011, 8) Soon after the conclusion of the Versailles Peace Conference, the Norwegian government also sought negotiations with Germany and Russia, who had been barred from it. Both countries had had a long historic involvement in the archipelago and the “Norwegian authorities realised that in the long run this factor [their exclusion from Versailles] might prove a source of political problems.” (Ostreng 1978, 19) Both countries agreed to and signed the Treaty between 1920 and 1925, the year Norway officially took over power of Svalbard. The Svalbard islands are covered by two, in part competing, legal frameworks: the Svalbard Treaty and the United Nations Convention on the Law of the Seas (UNCLOS). While the former established the above mentioned unique model of sovereignty and access to the Svalbard archipelago, the latter is a multilateral convention which applies globally and is meant to provide general rules for delimitations and access rights in coastal and high seas areas. 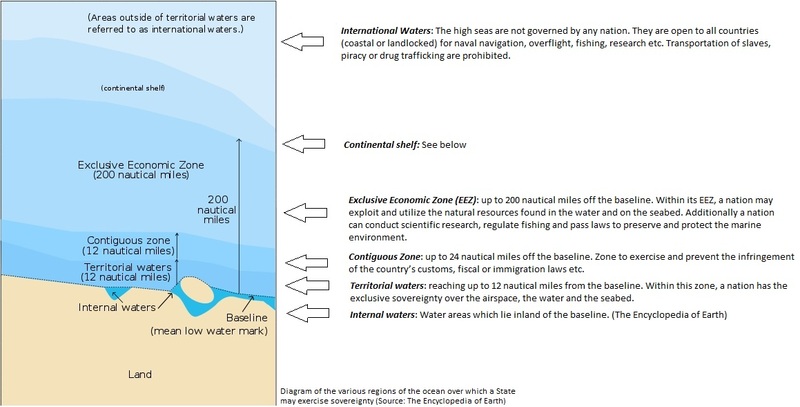 Additionally to the maritime border setting, the UNCLOS has established another principle, through which further territorial claims can be made. By looking at the extent of the continental shelf, nations can claim portions of the seabed that might well exceed the 200 nautical mile EEZ (a maximum of 150 additional nautical miles). 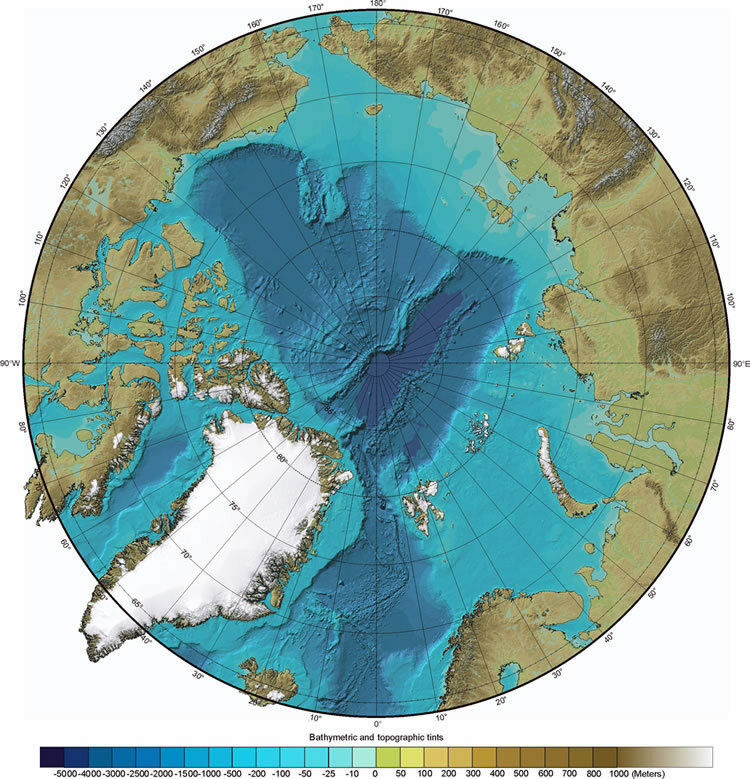 Unlike the other zone boundaries, the continental shelf is a real and natural geological boundary. The term covers a geological formation which lies between the continental landmass and the deep ocean. The nation to which such a shelf belongs has the right to “explore and exploit the non-living natural resources of the continental shelf as well as the living organisms that live on the seabed itself” (UNCLOS art. 77). The water above the seabed is considered part of the high seas. The map to the left shows ocean depths in the Arctic. The lighter blue areas are more shallow and belong to a continental shelf. The darker blue areas are deep ocean areas. The dispute of ownerhip of Svalbard can be dated back until before the Napoleonic Wars. However, the specific conflict over the interpretation and rights under the Svalbard Treaty (1920) has latently existed for a couple of decades. The development of UNCLOS in the 1980s put Svalbard into the focus of more stakeholders. The conflict is not solved yet. The Svalbard islands are located in Northern Europe between the Arctic Ocean, the Barents Sea, the Greenland Sea, and the Norwegian Sea. They belong to the Arctic polar region, which encompasses all areas northward of the Arctic Circle (at 66 33’ N). Svalbard stands for an archipelago consisting of several islands: Spitsbergen, Nordaustlandet, Edge ya, Barents ya, Prince Charles Foreland, Kong Karls Land, and Kvit ya. The total land surface is 62,045 sq km. Theoretically, all of the signatory states to the Svalbard Treaty could become involved in a conflict over the interpretation of the Svalbard Treaty. So far, the Russia, the United Kingdom, Iceland, Spain, the United States and France have declared disagreement over the interpretation of Treaty provisions and Norwegian unilateral regulations. Mostly off-shore in the EEZ or continental shelf zone. 1. Can Norway claim new maritime areas under the UNCLOS regime that stretch beyond the territorial sea as recognized in the Svalbard Treaty? Until recently, Norway and Russia have been the only signatories with permanent economic interest and presence in Svalbard. (Emmerson 2010, 93) The prospect of large oil and gas findings in the continental shelf of Svalbard is likely to increase the tensions around the interpretation of the Treaty. The high number of signatories of the Svalbard Treaty and the new opportunities which climate change brings in the region make the emerging dispute over sovereignty and access rights to resources a global issue. (Numminen 2011, 14) So far, however, the conflict is a latent one and diplomatic in nature. Conflict arises when Norway unilaterally imposes economic regulations in the area. The Norwegian government for Svalbard can exercise its authority through strong environmental regulations and uses them to limit other signatories’ economic activities in the area. (Emmerson 2010, 92-93) The most controversial example is the Exclusive Fishery Zone around the archipelago, which Norway created in 1977. Albeit non-discriminatory (Norway alloacated quotas to all signatories), this does restrict economic activities in order to protect resources. (Scotcher 2011, 22) Additionally, after UNCLOS went into force, Norway claimed the exclusive access to the EEZ and the continental shelf around Svalbard (see more below). Small incidents show tensions especially between Norway and Russia. Until now, they have all been related to fishery rights, rather than exploration of oil or gas fields. In May 2008, the Svalbard governor made a Russian fishery vessel leave a Svalbard port because it lacked “proper documentation” to dock. The Russian protest came promptly, saying the vessel had acted within its Svalbard Treaty rights. (Emmerson 2010, 92-93) In another instance in 2001, a Russian trawler was apprehended for violating Norwegian mesh size regulations in the area. The Russian State Committee for Fisheries threatened to call the Russian Northern Fleet if it was to happen again. This remained a threat and today the relationship between Norway and Russia with regard to the Barents Sea has improved. Last year’s Treaty on Maritime Delimitation and Cooperation in the Barents Sea and The Arctic Ocean solved a decade-long border dispute between the two countries. The Google map on the left shows the application of the different maritime zones under the UNCLOS regime to Norway's Northern coast. 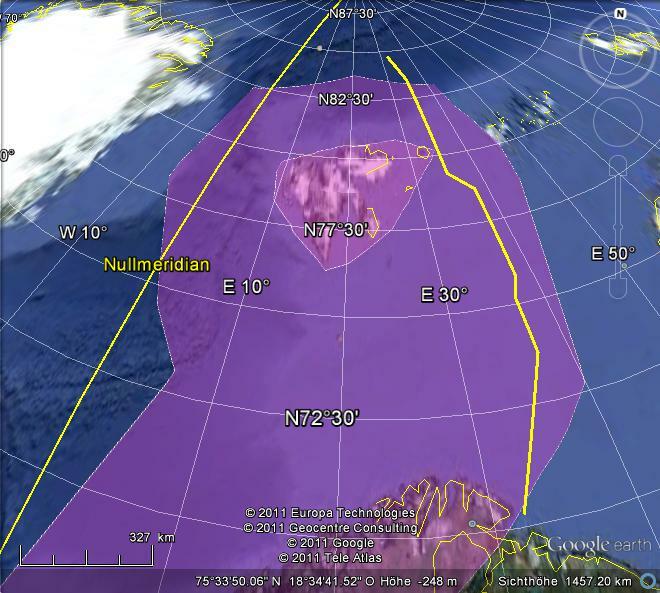 The inner circle around Svalbard indicates the territorial waters and the large pink area represents roughly the size of Norway's EEZ as confirmed by UNCLOS in 2009. The yellow line situated east of Svalbard is the new maritime border between Norway and Russia. The border agreement is the result of a long process of nagotiations which included issues such as fishery rights and oil and gas exploration in the Barents Sea. Norway’s point of view is quite clear in this matter. It invokes the wording of Article 1 of the Treaty which clearly limits its provisions to the islands themselves and their territorial waters. (See Legal Situation) In the Norwegian interpretation, the special provisions of the Treaty do not extend the above mentioned limits. According to the Norwegian government, it is alone entitled to exercise the right over maritime zones beyond the 12 nautical territorial waters limit. In the past, Canada and Finland have supported this view. But the same argument could be laid against Norway’s sovereignty of these maritime areas. The Svalbard Treaty gave Norway the sovereignty over the specified area and not beyond. If Norway is to extend its jurisdiction to new UNCLOS-covered zones, it must do so under the special conditions of the Treaty. A number of signatory states have expressed their view that Norway is not entitled to exercise sovereignty over the EEZ or a continental shelf. Low level of conflict. No military incidents. The conflict is mainly visible at the diplomatic inter-state level. There have not been any documented casualties or deaths until now. Nowhere are the effects of climate change more visible than in the Arctic region. The diagram shows the dynamics between climate change and conflict potential in the Svalbard area. The thawing of the thick ice sheets that cover huge parts of the Arctic ocean open up to increasing areas of icean surface in the summer. As a consequence, the seabed and what is expected inside become more easily accesible. As the USGS Survey report shows, this is likely to lead to an increased supply of fossil fuels. However, the question is who owns the resources. The highest probability for oil and gas sources are located around the coasts and would have to be dealt with through UNCLOS. However, in cases like Svalbard the sovereignty and ownership is not clear. Growing global resource demand is therefore the second major driver for developments in the Arctic. Deposits of oil and gas will increase the level of strategic importance of Svalbard. In light of retreating ice sheets and the depletion of current fossil sources, Svalbard could become a priority on the economic and energy agenda of many stakeholders. 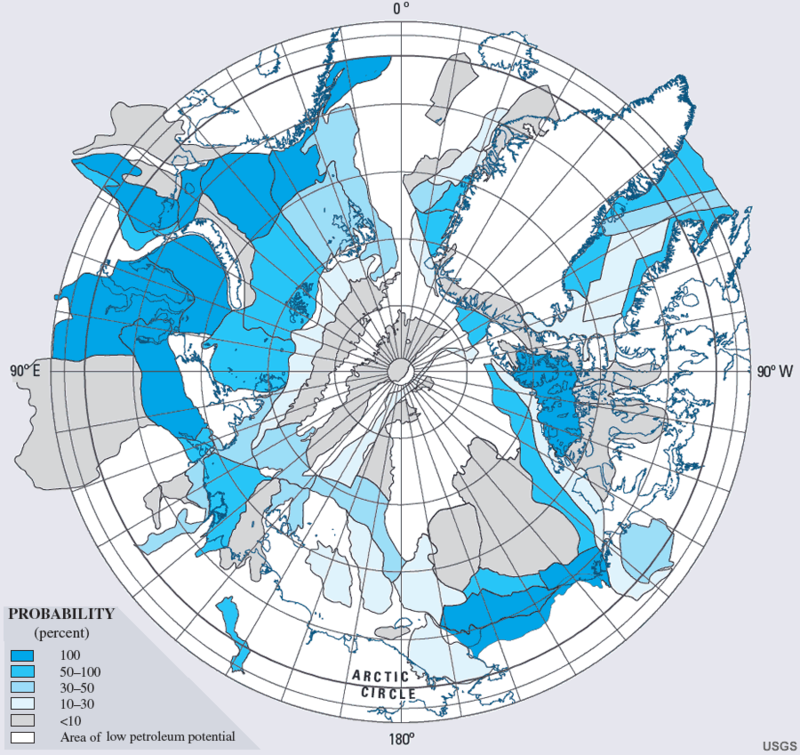 To conclude, it is important to note that according to the Svalbard Treaty, the archipelago is a de-miliarised zone. Any attempt by a signatory state to use military in order to enforce their economic rights would breach the Treaty itself. If the signatories want to keep up the Svalbard regime, they must solve the conflict with non-military means. However, if the signatories do not find a way to agree on a common understanding of the Treaty, there is no guarantee that it will survive another 90 years. In the light of increasing fuel demand and decreasing supply, the conflict for Arctic resources, including those in the Svalbard area, will intensify and might even lead to an armed conflict. One way to avert this scenario would be a clear definition of sovereignty and ownership rules in the entire Arctic. Complementary to this, an accelerated transition to a low-carbon economic system could prevent both the complete melt down of the Arctic and armed conflict for resources. Bailes, A. (2011). Spitsbergen Treaty in a Sea of Change. The Spitsbergen Treaty - Multilateral Governance in the Arctic. Arctic Papers, Volume 1, 34-37. Emmerson, C. (2010). The Future History of the Arctic. New York, NY: Public Affairs. Numminen, L. (2011). A History of the Functioning of the Spitsbergen Treaty. The Spitsbergen Treaty - Multilateral Governance in the Arctic. Arctic Papers, Volume 1, 7-20. Ostreng, W. (1978). Politics in High Latitudes: The Svalbard Archipelago. (Christophersen, R.I., Trans.) London: C. Hurst & Co. (Publishers). Ostreng, W. (1994). The Northern SEa Route and the Barents Region. In Schram Stokke, O. & Tunander, O. (Eds. ), The Barents Region. Cooperation in Arctic Europe (159-172). London: SAGE Publications Ltd.
Ruddiman, W.F. (2005). Plows, Plagues and Petroleum. How Humans Took Control of the Climate. London: Princeton University Press. Sale, R. & Potapov, E. (2010). The Scramble for the Arctic. Ownership, Exploitation and Conflict in the Far North. London: Frances Lincoln Ltd.
Scotcher, N. (2011). The Sovereignty Dilemma. The Spitsbergen Treaty - Multilateral Governance in the Arctic. Arctic Papers, Volume 1, 21-33. Turner, J. & Marshall, G.J. (2011). Climate Change in the Polar Regions. New York, NY: Cambridge University Press. Wallis, D. (2011). Introduction. The Spitsbergen Treaty - Multilateral Governance in the Arctic. Arctic Papers, Volume 1, 5-6.